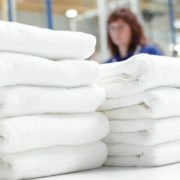 Patient Care at Stake When Moving Processed Healthcare Linen - Lee Soap is a industry leader providing turn-key products and solutions for the Automotive Care, Warewash, Laundry, industrial and janitorial industry. CHICAGO — After linens and textiles are processed, it’s important that the goods remain clean from the laundry to the customer or to the shelf—and to the end-user. Clean transport is even more important when it comes to healthcare linens. “If your healthcare organization and those in the laundry industry are not doing known, evidence-based clean procedures at 100%, that could have an impact on the patient level,” says Dr. Fontaine Sands, an associate professor at Eastern Kentucky University. In other words, if hygienically clean healthcare linens aren’t transported and moved properly, they could become contaminated and possibly lead to patient infection. Appropriate transportation systems, packaging/storage means and handling methods are key to maintain the cleanliness of healthcare linens. 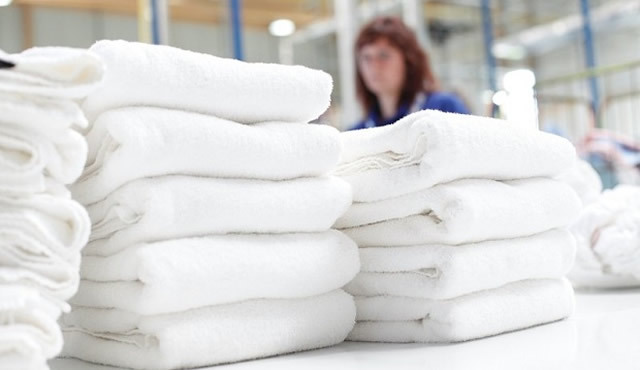 According to Randy Wendland, CLLM, corporate director textile management services/TSR at ABM Healthcare Support Services in St. Clair Shores, Mich., the integrity of clean linen starts within the processing plant—the laundry. Wendland says that processes must be in place to ensure cleanliness of work areas, processing stations, finishing equipment and material-handling devices. An important step in the process is to keep processed healthcare linens covered. “After clean linens have been placed in bulk containers or exchange carts, properly sized, impervious covers need to be utilized to ensure 100% coverage during transportation,” Wendland says. He stresses that whether the linens are being transported to the end-users from off site or on premises, proper container covers must be utilized to ensure that no contaminants are introduced to the clean linens. Also, Wendland says if reusable covers are used, a cleaning process must be used for them on a pre-established frequency. Jeff Scott, manager of on-site services for Ecotex Healthcare Laundry Services based in Washington state, agrees that it is important to ensure that all clean linens are delivered in a sanitized cart and that the linens remain covered from the point of assembly to point of use. When it comes to transporting clean healthcare linens from an outside laundry to the healthcare facility, transportation methods vary slightly. However, generally speaking, says Scott, healthcare linen needs to be protected from outside contamination, and vehicles need to be sanitized between loads. Scott says that the journey between plants and the end-users can be challenging. Vibration and outside influences can cause linen to shift or even fall off packaged containers. “Goods fall off of shipping containers in transit due to vibration or improper loading. Items are sometimes placed on clean-linen carts once delivered to the customer that are inappropriate and may cause contamination,” Scott says. He stresses that great care needs to be taken to ensure processed linens are loaded in a neat and orderly fashion and are securely placed in delivery vehicles. Scott says that his company trains its drivers and on-site delivery personnel to immediately report any incidents and to immediately place into soiled-linen containers any item that they feel may have been contaminated. “This includes returning entire shipments if there is a chance of contamination,” he says. When the clean linen gets to the client, storage remains a challenge due to space restrictions in some cases, according to Scott. Some of the challenges Wendland sees on-site when it comes to maintaining the integrity of clean healthcare linens in transport include wire racks and exchange carts stationed in corridors and open nurse server storage areas. “I’m always concerned with properly fitted covers used on wire-rack exchange carts, as well as after-market solid bottoms,” he says. “Also, Velcro closures versus zippers. Velcro does not make an impervious barrier. Wendland is seeing progress being made in on-site transportation and storage concerns at healthcare facilities. More solid poly carts are being used in place of wire racks, he’s noticed. Also, he has seen that wire racks are being re-tasked for either non-movable storage or non-linen items. If a laundry is having difficulty maintaining clean healthcare linen during transportation, how can it correct the problem? When it comes to transporting clean healthcare linen, Wendland focuses less on accreditation and more on employee training. “There is concern regarding laundries being ‘accredited,’ yet there is minimal credentialing requirements for the leaders and managers of laundries or linen distribution departments. The best way to ensure that the integrity of the linens is maintained from ‘processing to end-user’ is to have trained and knowledgeable employees,” he says.